Military Personal Finance eBook, Andre V. Milteer, M.A. intelligent and full of promise, he was TERRIBLE with money. But he wasn’t alone…many single soldiers, sailors, and airmen shared a similar problem. 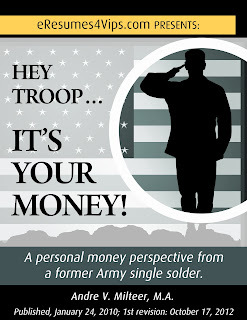 Simply, personal financial management –are some military personnel doomed to spending failure? I think not! As this soldier progressed along his military career, he received lots of help. His NCO support chain (non-commissioned officer) stepped in to provide leadership (wanted as well as unwanted). He also had a government-issued meal card. Meaning: after he spent all of his pay, the Army provided him three square meals per day. It has taken me +30 years to admit that I haven't always been the in-charge money manager that I am today. Across the board, the Military has wrestled with the question of why Junior Enlisted Soldiers, Sailors, Reservists, and Airmen struggle with personal finance management. With a spirit of paying it forward, I wrote a small [free white paper] eBook about this subject. It's an easy read, yet I held back from mass marketing it. Sometimes, we are our own worst enemy. To stretch my comfort zone, I'm going to share the 11 page eBook with you all. Certainly, this won't be seen as earth-shattering for you all...yet, this is HUGE for me. After (free) downloading and giving it a quick read, please post a comment here or post a comment on my Twitter or Facebook Fan page. Here is the link... Enjoy!